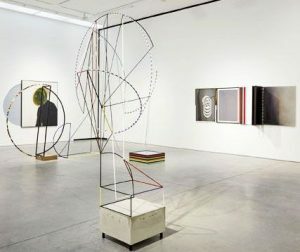 The works in Matthias Bitzer’s show, “a different sort of gravity” couldn’t be more confounding or diverse; this is the show’s aim. On my first view, I found the installation to be incoherent, even confusing. It took my breath away. On the second view I realized that the exhibit resonates with a sense of its true meaning, but this baffling heterogeneous display takes time to grasp. The show merges visual information with conceptual ideas that are formulated around the juxtapositions of distinctly dissimilar art forms. There are multi-panel glass wall pieces with stepped tonal hues, geo-painted metal floor sculptures, and obtuse imagery in paintings of a disturbingly Kafkaesque nature on view. A complex two-wall installation features drawings, paintings, and photographs. The most confounding pieces are “impalpable tambourine (what else is the soul? ),” “spinelsyntaxl surface,” and “universal glance,” all 2016. 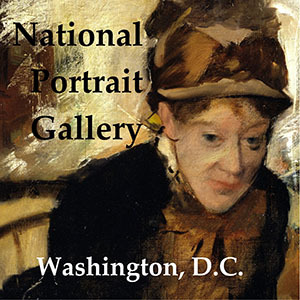 In “universal glance” a half of a woman’s face is shown beside a black and white diagonally sliced rectangle, in a searing analysis of a very human depiction of longing. 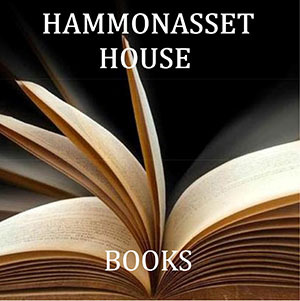 “impalpable tambourine (what else is the soul? 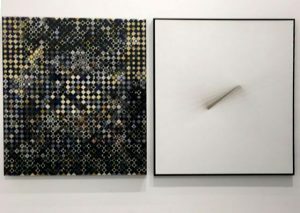 )” includes geo-patterns, a portrait and what appears to be biomorphic fuzz in a work that attempts to create universal connections within disconnections. While the piece may not function fully, it is startling and thought provoking regardless. Left: universal glance, acrylic, ink on canvas, wood (2016). 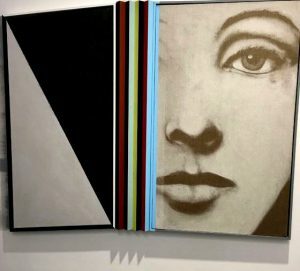 The purely visual “Masked Mistress” and “Emulous Mask” (acrylic, ink on canvass), are about two different kinds of masks. The first refers to the human masks we affect in social situations to hide our true personas, but “emulous mask” penetrates much deeper. It confers a spreading, all encompassing dislocation that deprives us altogether of our identity and humanity in a threatening way. Deep gray semi-circles skirt one side of the painting, adding ominous, menacing vibes to the total installation gestalt. The mixed media installation “Phosphor Notes (a different sort of gravity)” (2016) provides a historic, aesthetic and visual link hinting at Germany’s past that does not seem connected to contemporary experience. I cannot appreciate the geo-painted freestanding metal sculptures set in the center of the space. From a distance gazing through them at the other works is a bit irksome. Right: mutiny against measurement, metal, paint, wood, including base (2016). This show is a prime example of authentic conceptual art that makes its statement by the means of visual art. Conceptual art regrettably has become a catchword in the NY Art World, which seems to include whatever writers can contrive about imagery obviously visual or perceptual. This trend is sweeping the art scene, leaving an aftermath of confusion, anxiety and insecurity. 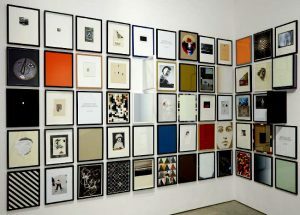 It may be beneficial to investigate some boundaries or criteria to better ascertain what is and is not conceptual art. We are not participants in the Russian or French Revolutions; evolving concepts played havoc with these social reforms to disastrous results. The rubric “conceptual” is playing havoc in the art world. I recently received an image of an abstract painting, sent from Klaus Von Nightssabend Gallery, of a painting entitled “Red Forest” by Benjamin Butler. The piece features rough looking painted lines that touch each other, set in a row meant to signify trees. This abstract piece is purported to mirror a Van Gogh painting called “The Starry Night,” with conceptual underpinnings. 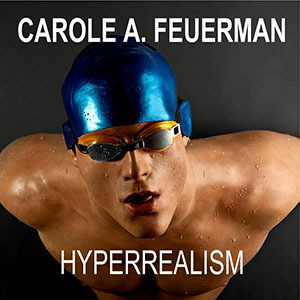 The use of imagination and fantasy are helpful ways to interpret works of art. But when the mind strays too far, it can convince one that black is really a new white, or day is actually a remake of night. 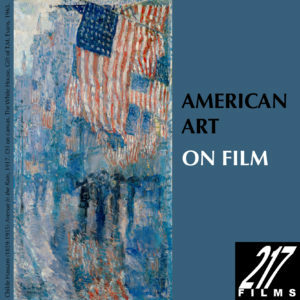 Every work of visual art, especially art that focuses on a theme, has ideas or what can be called “conceptual” components. This is natural, but this is not truly conceptual art. The Matthias Bitzer exhibit is a model of the philosophical and perceptual nature of an art where the conceptual focus is intended to scramble viewer stability and assumptions. Left: far left- particles of dust, paper and poxy on board; left- horizontal abyss, acrylic on canvas (2016). In the 1960’s Joseph Kosuth originated pure conceptual art by using words, language, as the sole basis for his new genre. 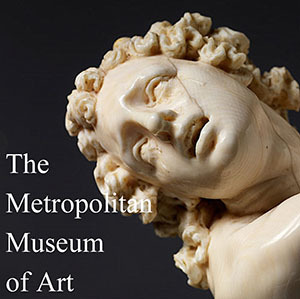 His group reduced art to “nearly pure information or idea,” (Wikipedia) deflecting the importance of the art object. 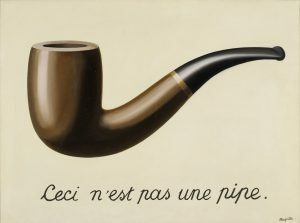 René Magritte gave us an example of concept illuminated in visual art with his painting of a man’s pipe entitled, “This Is Not A Pipe.” The piece is a painting of the item, not the physical object, itself. These are clear examples of conceptual ideas in painting. Rene Magritte, La Trehison des images (Ceci n’est pas une pipe), 1948, private collection. The wall work entitled “axis lux” draws the eye into a sequence of spaced glass partitions whose exterior perimeters are painted with a tonal scale ranging from white to dark, signaling the duration of the visual experience. “(90 degree frames, not yet titled)” creates a view through segments of glass that are open at the perimeters; the segments act as barriers we must strain to see through. The floor work of stacked glass entitled “Vertical Tunnel (what’s submerged in the world), relates to the “axis l ux” wall work, but its ground setting makes viewing difficult. This effect is evidently intentional. 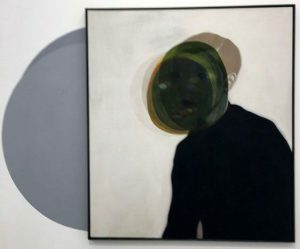 Left: emulous mask, acrylic and ink on canvas (2016). 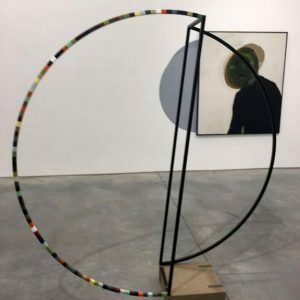 On reflection, this show will stun any viewer; the innovative relationships between the art, the walls and the gallery space conspire to create a breakthrough viewing experience. The philosophic historic underpinnings overlaid with visual sensations provide quite a surprise. If it weren’t so serious, I would dub this exhibit playful and musical. This is not the type of show that copycat artists can succeed with; it is brilliantly laid out, skillfully executed and juxtaposed with specific intention.